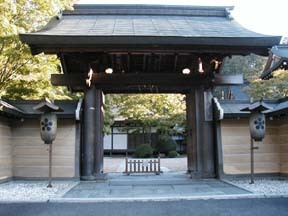 Temple Lodging in Japan "Tentoku-in"
The temple was named after the fact that the bones of Tentoku-in, the wife of Toshiie Maeda, a famous feudal warrior, were enshrined here. 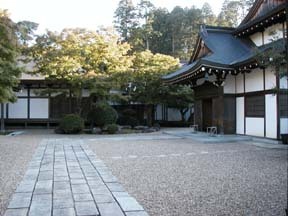 It has a Japanese garden designed by Enshu Kobori. You are able to appreciate this beautiful garden from the guest rooms made of Japanese cypress built in Shoin style. Tentoku-in is just what you would expect in a temple. The young priest and the assistant head priest who took care of us were nice and kind, and I was able to see their clean and modest daily life. It was such a meaningful experience to stay there. From the room, you are able to see a famous garden. (However it was completely covered with snow in January.) I did not feel cold even in the winter nights thanks to the kotatsu heater, the air conditioner and the warm futon mattress and duvet. The dinner shojin cuisine had three dishes and breakfast had two dishes including yudofu (tofu boiled in a pot). I jumped out of the room with the loud sound of bell and participated in the morning service. (You are free to participate.) Although I did not chant sutra because I belong to different sect of Buddhism, the service was quite solemn. I felt respectful thinking about the fact that they conduct this service every day in the hall where your breath turns white, even with the heater turned on. This shukubo is recommended for people who would like to stay in a true temple that is not influenced by commercial trends.